Special Event Management Guide from C.H.I.P.S. 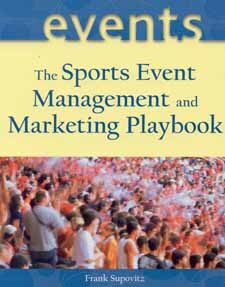 This authoritative reference on sports event management and marketing is a proven framework to envision, plan, fund, and produce sporting events! The Sports Event Management and Marketing Playbook is a step-by-step guide for the real world, offering expert advice on how to properly build sports events into successful and financially viable properties. Authored by a successful professional who�s in the trenches every day, this helpful resource offers both first-time planners and seasoned organizers with the expertise and framework for staging top-quality sports events at any level�from the community to the global stage. Define & Develop Objectives, Strategies & Tactics. Solicit & Select Host Cities & Venues. Start the Clock on the Event Planning Process. Understanding the Sports Event-Sponsor Relationship. Maximizing and Servicing the Media Partnership. Activating the Sports Event Marketing Plan. Sample Host City Request for Proposal. Request for Proposal Evaluation Form. Sample Facility Event License Agreement. Sample Sports Event Sponsorship Deck.